turboDial includes the capability to record your phones calls. To record a call you must begin the call by pressing the Record button immediately adjacent to the Call button. The recording begins when the call connects – the ringing part of the call is not recorded. If you begin your call by clicking the Call button instead it is not possible to begin recording the call after it has started. When you finish your recorded call a link to the recording will be saved in the Call Note for this call on the Contact Record. 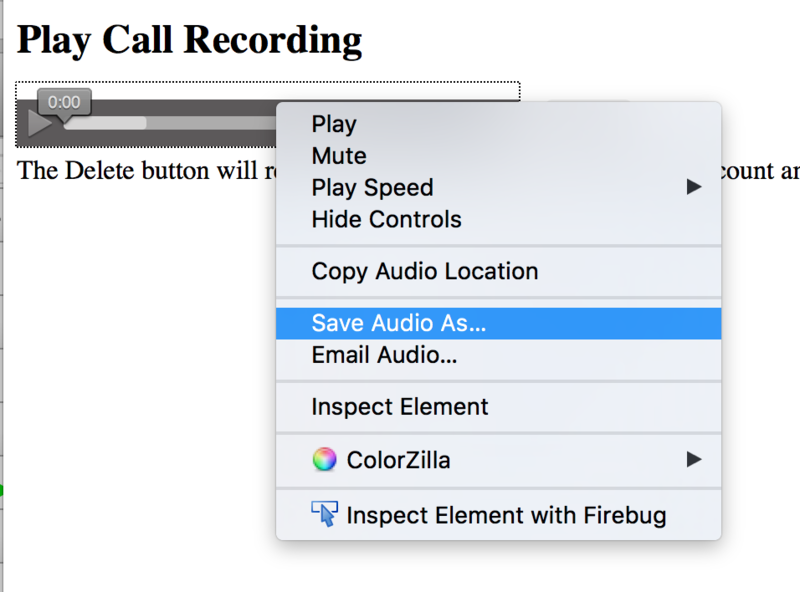 The “Call Recording” link on the call note can be used to playback or download the recording. Note: The Call Recording feature requires the “Call Recording” custom field in the Task/Appt/Note context of your Infusionsoft account. Please see the Guides & Videos topic “Enhanced Call Notes with Custom Fields” for instructions on installing this field in your Infusionsoft account. Please be aware of your local legal requirements since they vary from region to region. In some areas you are required to inform all parties on the call that the call is being recorded. Click the right-arrow to playback the recording. If the Delete button is present then you can use it to delete the recording. If you right-click with your mouse on the playback bar your browser will give you an option to download the recording. You can force all outbound calls to be recorded using the “Global Options” settings. Those tools are accessed using the red pencil button next to your email ID in the header of the turboDial panel. Only an account owner will see the red pencil; it is not available to other Users who are not account owners. Your recordings are stored by Twilio in your Twilio account. The Call Recording Link is a link to the Twilio stored recording. See the Pricing page for information about the cost of long-term storage of your recordings. If you are the account owner, you can also find a list of your Call Recordings in your turboDial Management Account. When you open the “View Call Recordings” link on that page you can right-click to download any individual recording listed there.